Most chapters follow the cell structure topic with one on the cell membrane and diffusion and osmosis. These concepts can be very difficult for students to understand. 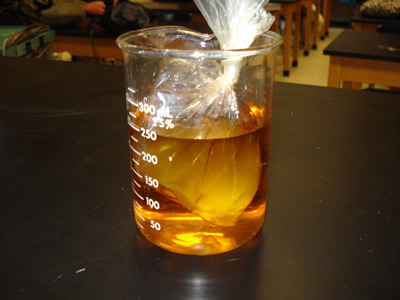 In order to give them a view of how diffusion works with a semipermeable membrane, I like to do a lab that uses a plastic bag to model the cell (membrane). It is a simple lab where students do very little except watch the process and record data and information. To set it up, you will need plastic bags, iodine, water, and corn starch. All except iodine are readily available at the supermarket. Next, take the plastic baggie and add a spoonful of cornstarch and about 100 ml of water. You don’t even have to be exact. I like to do at least one of these while the students watch, or you can have the students make them (but be prepared for a mess). 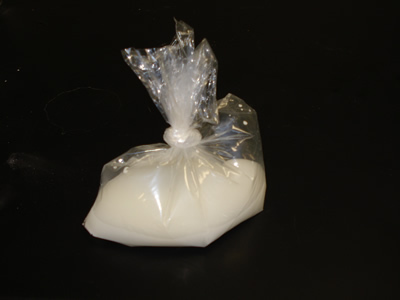 Tie the baggie off and explain to the students that the bag represents a cell, with the cytoplasm being the cornstarch mixture and the plastic is the cell membrane. Explain that solid objects are not really solid at a molecular level and that the bag is more like a tiny little screen door. If molecules are small enough, they can pass right through the bag. 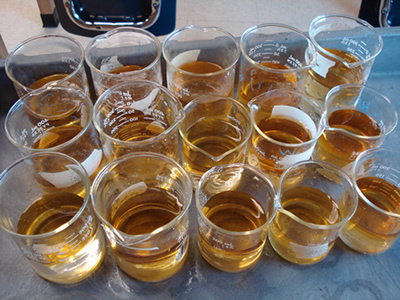 With the baggie in place, you will need to prepare enough beakers for your entire class. Fill them about half full and add several drops of iodine, you want the water to be very orange. The more concentrated the mixture, the faster the reaction. This is also a good time to point out that iodine is an “INDICATOR” in that it will change color whenever it encounters starch. You can demonstrate this with a beaker of starch solution and a drop of iodine. Students will carefully place the baggie into the iodine mixture. Their worksheet will ask them to make some predictions about what will happen and to define diffusion and osmosis. The process should take about 15 minutes and students should notice a change in the color of the corn starch in the bag. Students will then be asked on the worksheet to explain what happened. A common misconception is that the iodine “ate” through the bag. 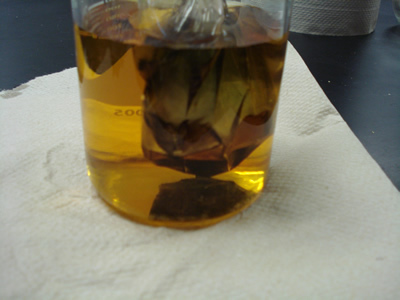 Remind students that the bag is like a screen door and iodine is a very small molecule. Despite the fact that this lab is not very interactive, students do seem to understand the cell model and semi-permeable membranes after completing it. Many will ask to see what will happen if you put the starch in the beaker and the iodine in the bag. I’ll set this up and they can view the results the next day.